Gaiam is a leading lifestyle brand with a mission to make yoga, fitness, and well-being accessible to all. Gaiam brands include Gaiam, focused on yoga and fitness; Gaiam Restore, focused on wellness; SPRI focused on fitness, and its eco-travel business, Natural Habitat Adventures. Receive top new Coupons for Gaiam by mail. 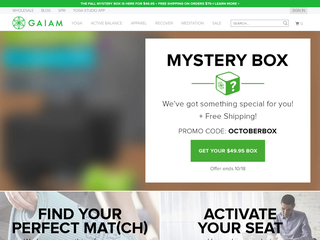 Top Gaiam-Coupons always fresh in your mailbox with high Data Protection.